Wow! 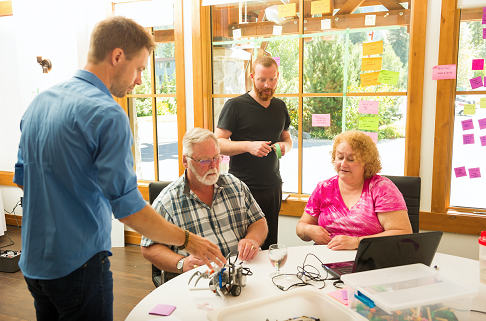 More fun and learning in Whistler at the Strategic Playroom! Our first training for Project Teams in Motion happened last week. It was a super group of people and we could not have had any more fun. Fun and play are not always easy. In fact, the best kind of play is often the hardest work. The world is full of big, messy problems and teams are often pulled together to solve them. Who is going to do that work? It could be teams that are disconnected or disengaged. But it could also be groups of people who work well together and who are aligned. 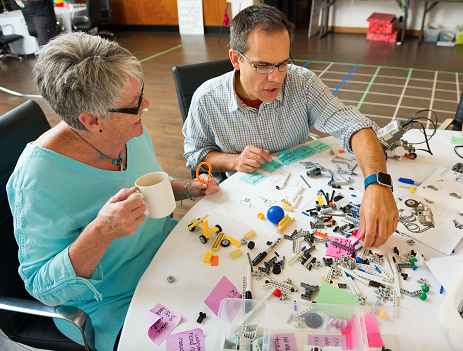 In this facilitator training we blended LEGO® SERIOUS PLAY® methods with LEGO® Mindstorm™ Robots, and we offered up an interactive, team-based workshop to train LEGO® SERIOUS PLAY® (LSP) facilitators in a new way to work with project teams. This is a new way to help teams become high performing. The facilitators who attended this training will create their own workshops based on this methodology, and we hope to add many of their own ideas into the mix. They will use these tools and activities to build customized workshops that illustrate the stages of team development and highlight individual behaviors, values, and beliefs that drive team life and become team culture. They will do this while using the underpinnings that power LSP. It’s always interesting to see how play has the ability to draw people in and provide the best experience for learning. Everyone knows children learn through play, but what they may not realize is that play allows for a new level of learning to emerge in all participants. In play, people learn about themselves. And they learn the things they need at that time. As facilitators we see it all, the good, the bad, and maybe even the ugly, as elements come right to the surface in teamwork. When we add a goal or a deadline, provide limited resources and vague instructions, and add in people with diverse thinking styles, it becomes as real as life. In play based, interactive workshops, the debrief and reflection are key. It is not about the challenge. It is always about how we play, how we show up, how we process, how we connect. It is about how we behave. It is the brave soul who can really take a long and sober look at how they function in groups. We can all perform well alone, but what about when it gets messy? 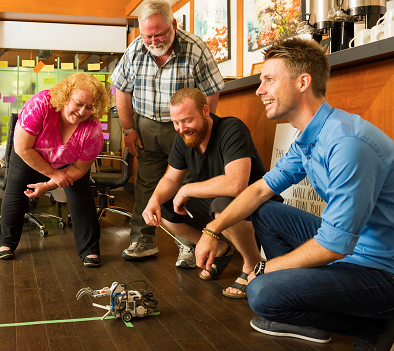 The power behind the Project Teams in Motion is to use play to create a safe playroom/laboratory where people take risks, explore, tinker and build, and create and collaborate—or not. 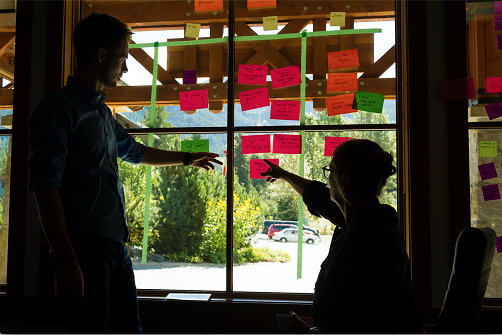 They give meaning to what they build and tell their story as they work in rapid iterations. Their story is their own and always quite different from the next story. Everyone’s story is validated and makes up the bigger story of the team. During and after play, we invite people to examine their own performance, their feelings, their needs, their priorities, and to reflect upon their own behavior and performance. But again, performance is not measured in relation to the goal. It is measured in relation to how people interacted on a team and what kind of a team role they played. As a play facilitators it is not our job to fix a team or even teach them something. However, it is our job to provide a program that can take people to the edge of their learning and help them to break through to the other side.